Rainier Arms Raptor Ambi Charging Handle (Ambidextrous Charging Handle) by AXTS Weapons Systems for AR-15 Tactical Carbine/SBR’s and AR-10/SR-25 Tactical Rifle/Carbines | DefenseReview.com (DR): An online tactical technology and military defense technology magazine with particular focus on the latest and greatest tactical firearms news (tactical gun news), tactical gear news and tactical shooting news. While DefenseReview (DR) was walking the floor at SHOT Show 2013, we ran into our friend John Hwang, owner of Rainier Arms, right by the Bullet Bunker booth, and he showed us the Rainier Arms Raptor Ambidextrous Charging Handle by AXTS that was designed and developed in collaboration with AXTS Weapons Systems for AR-15 Tactical Carbine/SBRs, so we took a minute to photograph and handle it. The AXTS AX556 and AX762 Ambi AR Lowers, which utilize the AXTS A-DAC ambi-lower receiver system, where the first products DR covered from SHOT Show 2011 because we thought the A-DAC was so interesting. 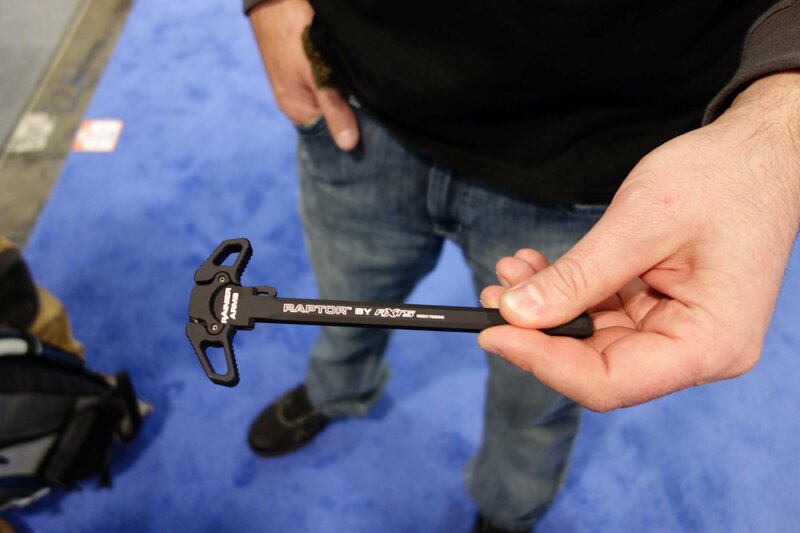 The Raptor Ambi Charging Handle looked well-designed and quality-manufactured to us, which didn’t surprise us, since Rainier Arms is known for carrying quality products. Upon examining it, we were immediately curious as to how the Raptor stacks up against both the Bravo Company Manufacturing (BCM) BCMGUNFIGHTER Ambidextrous Charging Handle (5.56mm/.223) w/ Mod A44 (Ambi) and the Phase 5 Tactical Ambi Battle Latch/Charging Handle Assembly (ABL/CHA), the latter of which Defense Review mentioned in our 2012 article on the Legion Firearms LF-15D and LF-15C. Defense Review hasn’t yet run any of the the above-mentioned ambi charging handles, yet, but we’d certainly like to run them all at the range under high round count, and compare them. Perhaps someon out there has already done a high-round-count side by side test and evaluation? Regardless, DR is an ambi charging handle proponent, since ambi charging handles provide shooters with greater versatility. Your humble correspondent has been taught how to shoot ambidextrously in force-on-force dynamic CQB/CQC (Close Quarters Battle/Close Quarters Combat) environments by the great Dave Maynard of Combative Concepts, so I appreciate anything on my gun that gives me any speed or weapons-handling advantage whatsoever in a gunfight. Gunfighting is no joke, so you want to have every advantage available to you. By the way, speaking of Legion Firearms, DR came across a Rainier Arms Raptor .308 AR Ambi Charging Handle on the Legion Firearms LF-10D 14.5″ 7.62mm NATO/.308 Win. DMR-type tactical AR-10/SR-25-format carbine at their booth, shortly after we ran into the Rainier Arms boys. So, the boys at Legion must like it, too. 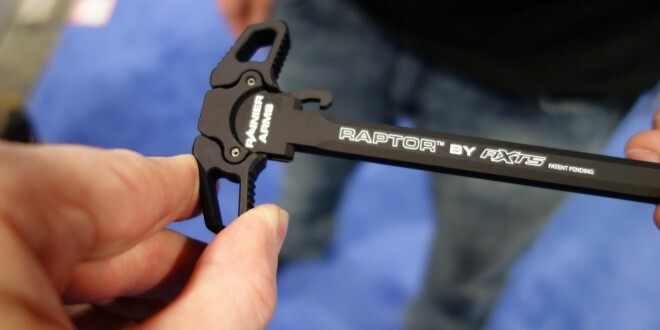 If you’d like to order a Rainier Arms Raptor Ambidextrous Charging Handle by AXTS, DefenseReview highly recommends you order it from either Brownells, or, interestingly, Bravo Company USA, which also carries the Raptor Ambi Charging Handle in their catalog, even though they’ve designed and developed their own their own in-house-developed BCMGUNFIGHTER ambi charging handle. Both Brownells AND Bravo Company are great companies. 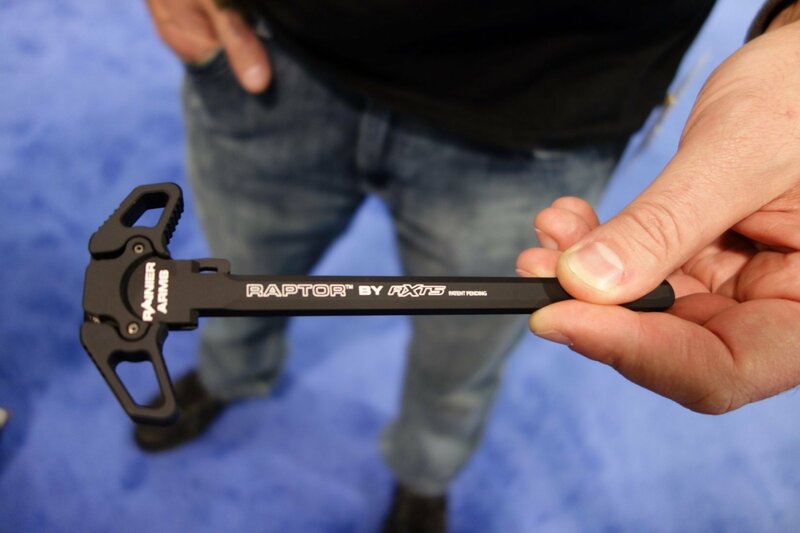 “Rainier Arms Raptor™ ambidextrous charging handle by AXTS. 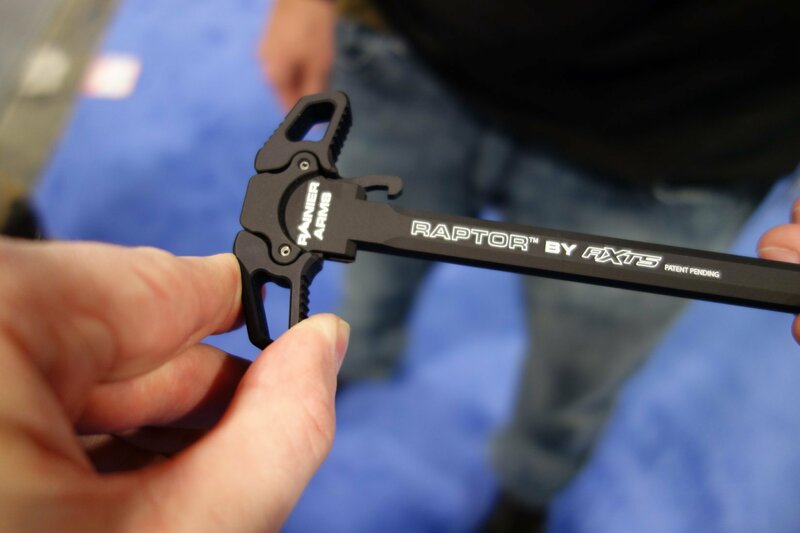 The Raptor™ is truly revolutionary in design & function. From rapid palm “blading” or finger thumb charges of the weapon, the motion is fluid & fast from either strong or support side. Made in the USA from aircraft grade 7075 aluminum and milspec anodized. Next: MWG IK-520 ’40-Rounder’ 40-Round Steel-Reinforced Polymer AR-15 Rifle Magazine (5.56mm/.223 Rem.) Lookin’ Good: Initial DR Range Report!